The Remarketing's Under 40 awards from the Auto Remarketing Canada Conference in 2017. See story below for this year's winners. Photo by Jonathan Fredin. From dealers to auction executives, from leading professionals at third-party providers and auto finance companies — and everywhere in between — the Canadian auto industry is full of young men and women who have achieved massive success at an early age. Thank you to all who nominated folks for this year’s awards program. While we could not include everyone who was nominated, it was truly inspiring to see the young people who are making waves in Canada’s remarketing space. 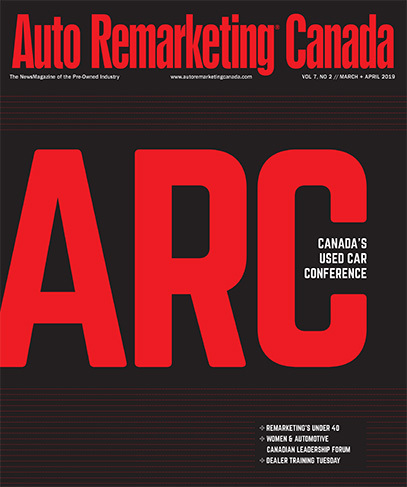 The 2018 honorees will be recognized in the special on-site conference edition of Auto Remarketing Canada magazine and during a March 28 luncheon, sponsored by EBlock, during the Auto Remarketing Canada Conference. Andrew Lemoine CoverageCorp Inc. / AutoCorp Technologies Inc.
Jim Williamson Williamson Chrysler LTD.